SUMMARY: A life of servitude with a stepfamily who hates you would be difficult for anyone. Cinder, a talented cyborg mechanic with a mysterious past, plans to leave her stepfamily as soon as she can. But leaving becomes complicated when Cinder is blamed for her stepsister's deadly illness. As Cinder's life becomes entangled in the search for a cure, Cinder meets and falls for someone way out of her league: the emperor's son, Prince Kai. REVIEW: The massive praise for Cinder is well-deserved. 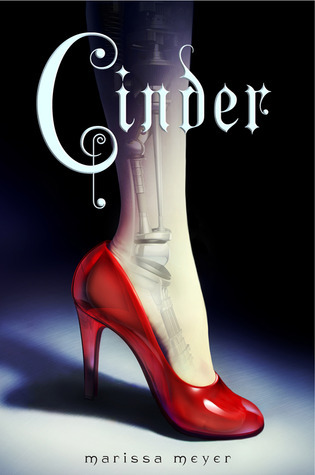 The story of a cyborg Cinderella is certainly unique, and, aside from one predictable "surprise", Cinder kept me guessing. I loved Cinder's character because though her identity and past are a mystery, Cinder knows who she is as a person. She knows she's a cyborg, a second-class citizen. She knows Prince Kai would never look her way if he knew her cyborg status. But among all the humans in the story, Cinder is among the most humane, the one who cares about the suffering of others more than her own. Cinder is smart and determined and loyal, and I loved her all the way through. I will say I am not as crazy about this book as many of the other reviewers I've seen. I liked it very much, but I'm just not gushing over it. It's crazy unique, but it took me a little time to get into. I wasn't as compelled to read it as I have been with Rossi's Under the Never Sky or Bracken's The Darkest Minds. This one was kind of like Roth's Divergent for me; I liked it very well, but I didn't go nuts over it. I found the big reveal to be extremely obvious (was it supposed to be a surprise? ), and I am usually not that great at predicting the twist. THE BOTTOM LINE: Definitely read it. It's one of the most unique and creative stories I've read recently, and it deserves a spot among the year's best. STATUS IN MY LIBRARY: We have one copy that is ALWAYS checked out, so I will be buying more from our book fair next week. When we received the sequel Scarlet last week, we had several put it on hold. While I think boys would like it just as much, the girls are the main ones checking it out. I loved both this book and Scarlett, and I have a copy of the ARC of Cress on to read shelf right now. I'm not reading it yet, because I have so many other things to read that will be coming out first.